Healthy gums do not bleed. If your gums bleed when you floss or brush your teeth, you have the very first sign of gum (periodontal) disease – otherwise known as gingivitis. You may notice after visiting the dentist how all of the yellow plaque has magically disappeared and your teeth look white all the way around. The successful removal of plaque is key in preventing gum disease. The more plaque that forms on your teeth, the more bacteria accumulates, in turn releasing toxins. Red, swollen, tender gums that bleed and chronic bad breath are all symptoms of gum disease. If you have these afflictions, do not wait any longer to visit your dentist. The toxins released by bacteria destroy the bone around the roots of your teeth. Did you know that once bone is lost, it will never grow back on its own? Never, ever. If too much bone is lost, there is hardly anything supporting your tooth. A tooth can become so loose, it either has to be removed or will fall out on its own. Believe me, there is no tooth fairy coming around giving you cold, hard cash when you’re an adult who knows better than to disregard oral hygiene. No pity shall be taken when gum disease is easily preventable. Healthy gums are tight against the teeth. Periodontal disease usually starts with inflammation of the gums in between the teeth. Dr. Jessica T. Emery of Sugar Fix Dental Loft can examine your gums via periodontal probing and taking x-rays. Periodontal probing measures the pockets between tooth and gum, typically 1 –3 mm deep. The pocket area measures between the bottom of the pocket where it attaches to the tooth, up to the top of the gums. The deeper the pocket, the greater the spread of gum disease. 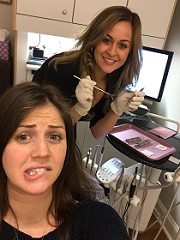 Visiting Dr. Emery and her team at Sugar Fix Dental Loft twice a year for your routine teeth cleanings is an excellent way to prevent gingivitis or help remedy disease if your gums are already infected. These teeth cleanings are when Dr. Emery will use common methods such as scaling and root planing to remove plaque and tartar that have formed in the periodontal pocket between tooth and gum. While scaling removes plaque and tartar from around and below the gum line, root planing scrapes and smoothes the root surface of your teeth. Healthy pink gums are a result of the gum tissue being firmly attached to roots that are clean and smooth. Call Sugar Fix Dental Loft today if your gums show any sign of being red, tender, swollen and most importantly, if they bleed. Any of those symptoms means you don’t have healthy gums. Why wait until your tooth is loose? Yes, when you are a child, losing a tooth is rewarding and exciting. Not so much when you’re a grown up.